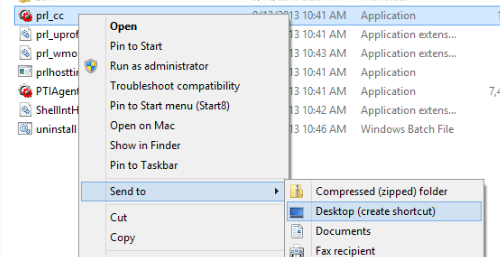 Shared clipboard between the Windows 8 virtual machine and the Mac does not work. Windows drive is not mounted on the Mac Desktop when virtual machine is running. Not able to launch any Windows application from the Dock. Drag and drop between Windows and Mac does not work. 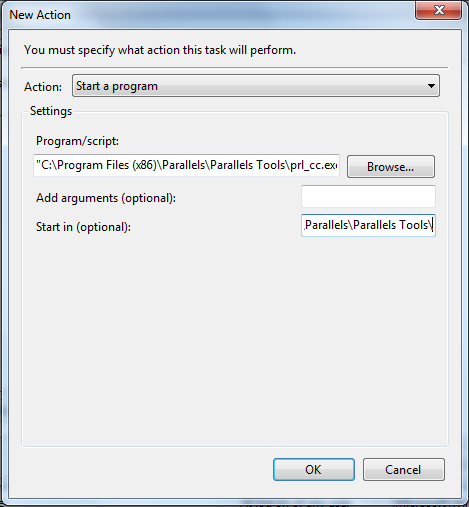 One of Parallels Tools components (prl_cc.exe) hasn't been launched with Windows start. While on Modern UI ("Metro", with live tiles) screen start typing task manager. the search box will show up and the "Task Manager" will appear in the search results. Click on Task Manager. Open Startup tab and look for prl_cc.exe or Parallels Control Center. 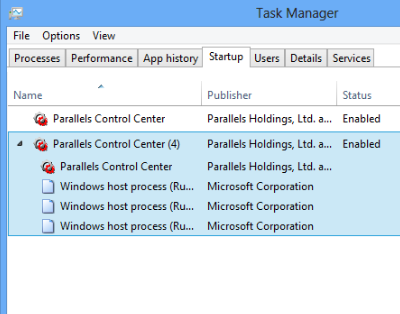 If prl_cc.exe (or Parallels Control Center) is there, please make sure that it is running. 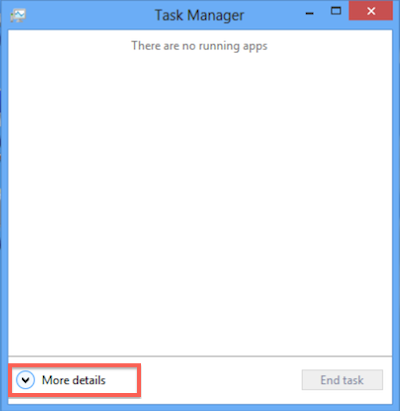 Restart the virtual machine and check the issue. If it persists, please turn off User Account Control (UAC) and check again. Press Enter. 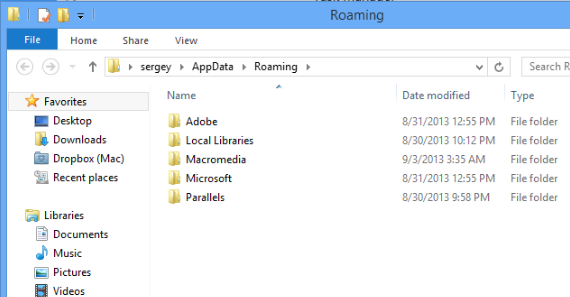 This will take you to âC:\Users\user-name\AppData\Roamingâ folder. Navigate to â\Microsoft\Windows\Start Menu\Programs\Startupâ. 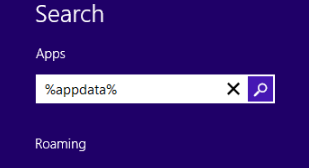 The full path should now look something like: âC:\Users\user-name\AppData\Roaming\Microsoft\Windows\Start Menu\Programs\Startupâ. Put the prl_cc.exe shortcut you created at step 1 into the Startup folder. Reboot the virtual machine and check the issue. Another way to add prl_cc to Startup is to use Task Scheduler. 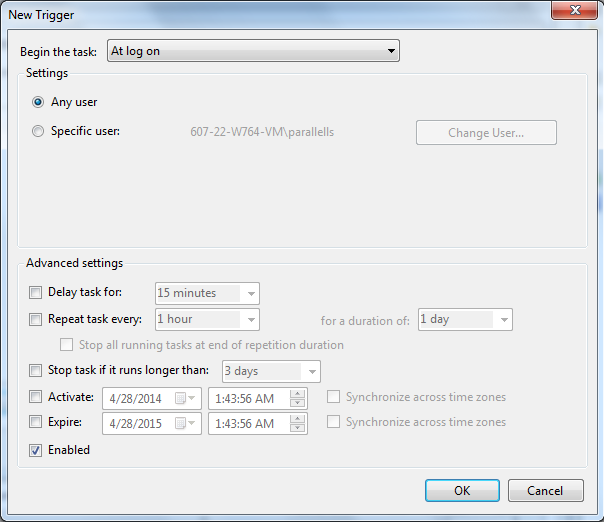 This method is suitable for both Windows 7 and Windows 8 with minor differences. 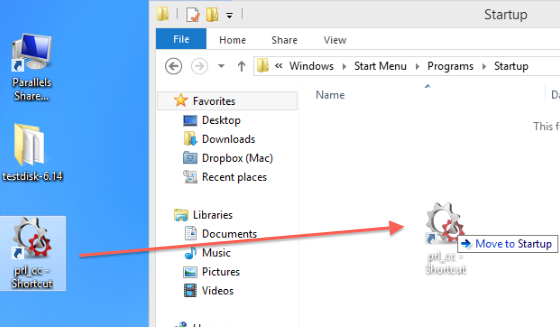 In Windows, go to Start menu. 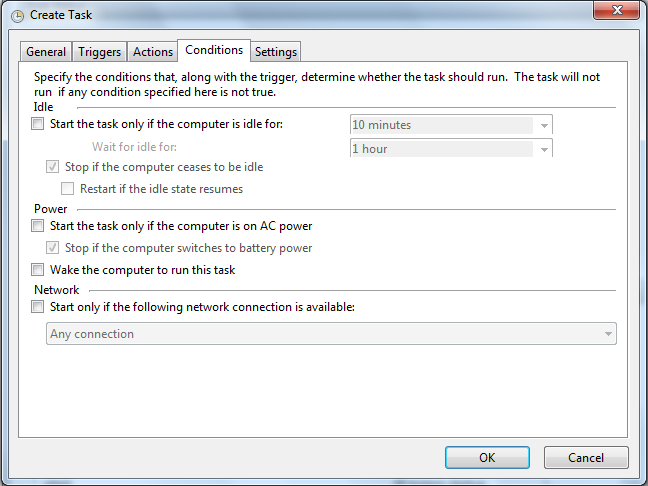 In the search bar, type Task Scheduler. Launch the application. 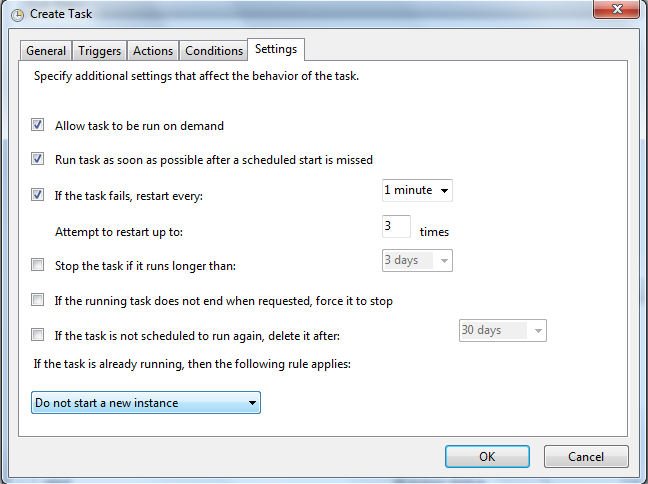 Select Create new Task on the right. 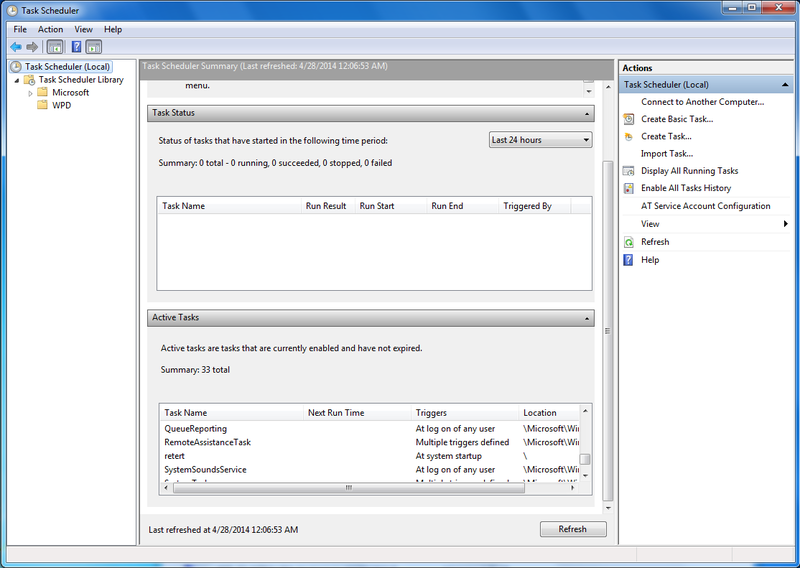 Specify the parameters according to screenshot (choose the appropriate Windows version). On the Triggers tab, select New. Specify the parameters accodring to screenshot. On the Actions tab, select New. Specify the parameters accodring to screenshot. On the Conditions tab, specify the parameters accodring to screenshot. Finally, on the Settings tab, make sure everything is set as on the screenshots. Reboot your virtual machine. Parallels Control Center should start now after logging in to Windows. If the troubleshooting steps above did not help, check for any Firewalls or Antiviruses and disable / uninstall them as these may hinder the prl_cc.exe services. Then try to reinstall Parallels Tools.